Held in conjunction with the Fair Hill International CCI, the YEH Championships are open only to horses who scored at least 75 percent at a YEH competitions earlier in the year or 70 percent at two competitions. Having qualified in May at Waredaca with a score of 79.9%, Star Dazzler competed in the 5-year old division. Having placed 4th in last year’s YEH Championships as a 4-year old, we had high hopes for Simon again this year. Rain and temperatures right around 40 degrees made for less than ideal conditions, but Courtney and Simon were still able to put in a solid performance. Simon scored 88.8% in the jumping phase, better than any of the other 28 horses competing in the either the 5- or 4- year old divisions. 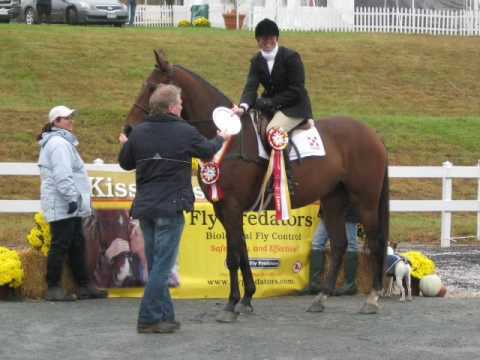 Together with his confirmation and dressage scores, he finished 2nd earning Reserve Champion. Click here for coverage in the Chronicle of the Horse, including Courtney’s comments from the post-event press conference.